This is a re-publication of the article: Hannemarie Ragn Jensen: ‘The Decoration of the Vestibule at the University of Copenhagen, Frue Plads’, in: Meddelelser fra Thorvaldsens Museum (Communications from the Thorvaldsens Museum) p. 1997, p. 131-141. What more could an ambitious young painter, nearing the end of his studies, wish for than a chance to show his talents in the form of a publicly accessible work of art? An offer from the University of Copenhagen in 1836 to selected students of the Academy of Fine Arts was thus clearly welcome. The University wanted the vestibule of the main building to be decorated, so that those entering it would not be confronted by bare and dismal plaster walls. The result would fulfil that wish to an extent that the Senate had hardly imagined; the interior decoration of the University vestibule would prove to be the largest and most complex work of art produced in 19th century Denmark. First, I shall give a breakdown of the programme used for the decoration, then detail its history and the stylistic and iconographic premises underlying it. Finally, I shall attempt to read between the lines and examine some of the underlying aims of the programme which were not set out explicitly by Constantin Hansen in connection with the creation of the work. Constantin Hansen wrote a brief explanation of the decoration when it was completed in 1853. Anyone who was interested could purchase this explanation for a very modest sum. He described the images of the decoration, beginning with the wall on the left, crossing the rear wall to the wall on the right, and ending with the ceiling. Four years later, in 1857, Hansen described the programme once again, now more comprehensively, in Nordisk Universitetstidskrift. He begins his description with the part that had to be painted first, the ceiling (fig. 78 and 79), since Hilker and Constantin Hansen had chosen to paint a fresco. Eos, the dawn, puts the darkness of night to flight by means of the morning star, Lucifer. Festoons of branches and decorative ribbons divide the ceiling into fields adorned with the signs of the zodiac, together with the most significant of the Olympian gods in the corners. The decorative ribbons also serve to link the pilasters on the walls together in pairs. A detail to which I shall return later. Following his description of the ceiling, the painter then describes the series of motifs on the main wall. He begins with the picture of Athena, who bestows a soul upon Prometheus’ clay figure of a human (fig. 80). Prometheus, the artist, has done his part in the work, now Athena/Minerva, the goddess of wisdom, steps forward to endow the figure with a spirit. Below this central field runs a horizontal frieze with grisaille figures on a green background. This frieze extends across all three walls and separates the lower area of the space, the base or plinth, from the decorated part of the wall above. The central field of the frieze shows Psyche’s descent into the underworld. She stands before the throne of Hades and, watched by Nemesis, the Eumenides and a Danaide, accepts a small box from Persephone. In a grisaille frieze set on a blue ground above the central picture, Psyche is led before the throne of Zeus by Eros, while Hebe pours the drink which is to make her immortal. In the field to the left, Prometheus is punished for having stolen the fire from Mt. Olympus and given it to the mortals. Apollo, who has taken pity on him, seeks to ease his harsh fate by playing his lyre. In the lower frieze, Eros lights the way back from the underworld for Orpheus. This is the fatal moment when Orpheus glances back and simultaneously loses Eurydice, who is gently restrained by Hermes. In the semicircular field at the top of the wall, Selene drives her chariot across the heavens. On the right, Prometheus, having suffered his torments, is helped down from the rocky cliff by Heracles, who has just slain the vulture. Heracles is the principal actor in the lower frieze, in which he is shown setting off with Cerberus, accompanied by Athena. In a semicircular field above the picture field, Helios steers his chariot across the heavens. Constantin Hansen used these motifs to illustrate “The conflict and victory of Life over the Underworld”. The main motif on the left wall is the birth of Athena (fig. 81). The Goddess flourishes her lance in a war dance, having sprung from the forehead of her father Zeus. It is no wonder that Zeus looks on with surprise from his throne. To the left of Athena, the midwife Ilithyia and the smith Hephaestus are witnesses to the dance. The nine muses fill the frieze under this field. 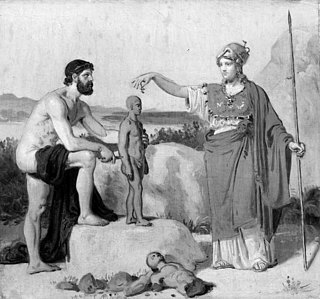 Above the field, Thetis comes to the smithy of Hephaestus to seek weapons for her son Achilles. Because of a passageway leading to the auditoriums, there is no side field to the left of the birth of Athena. On the right, Apollo is receiving a sacrificial drink. This is Apollo the soothsayer, the name Constantin Hansen already had used for Apollo on the main wall. The frieze beneath Apollo shows nymphs tending Pegasus, while, in the field at the top of the wall, Daedalus is busy making wings for himself and his son Icarus. In the semicircular section above the side passageway, Athena is instructing the shipbuilder Argus. The overall aim of the pictures is to present various examples of the poetic and artistic spirit in action. On the facing wall, the main field shows Athena’s victory over Poseidon (fig. 82). In this contest, in which the prize was Attica itself, Athena has just prevailed. Nike points to the olive tree Athena has planted. Poseidon looks on in a thunderous rage, while the salt spring he has struck from the cliff with his trident gushes forth. The lower grisaille frieze shows yet another example of Athena’s beneficent intervention: the Argonauts have arrived at the island of the Bebryces. Polydeuces follows the advice of Athena and overcomes Amycus. The frieze above the picture field shows a favourite classical subject, the battle between Centaurs and Lapiths. Apollo and Marsyas are competing in the side field. Apollo has not yet challenged Marsyas to play his instrument upside down, so the contest is still an equal one. Marsyas plays his flute, secure in his victory, blithely tapping time with his foot, while, to the left of the picture Apollo looks on calmly and knowingly. Below, Apollo is playing for the shepherds. In the semicircular section we see Bellerophon seated on Pegasus. Finally, in the semicircular section above the side passage is Chiron, the only centaur who is friendly and willing to communicate. Chiron is instructing Achilles in the art of throwing a spear. The motifs on this wall provide, according to Constantin Hansen, examples of “the victory of culture over barbarousness”. However, the programme is not yet complete. The decorations on the pilasters which divide the walls into three fields are also adorned with a series of motifs, which expand and refine the message of the pictorial programme. The adornment of the pilasters is ascribed to Hilker, but the programme itself must be attributed to Constantin Hansen. The left pilaster on the main wall is devoted to the myth of Ceres/Demeter, the goddess of the Earth. She can be identified as the figure with the sheaf of grain at the bottom of the plinth, and on the capital. We can also see further references to the loss of her beloved daughter Persephone. The plinth of the right pilaster shows Bacchus/Dionysus holding grapes, as well as other illustrations of other scenes linked to Bacchus as the god of wine and ecstasy. As previously noted, the pilasters on the side walls are paired. The two closest to the back wall thus show motifs from the myth of Oceanus, lord of the sea, and Thetis, his sister. These two Titans did not oppose Zeus and were thus allowed to rule undisturbed in their own realm, the Ocean. There was also another reason for Thetis being allowed to live in peace: both Zeus and Poseidon were captivated by her beauty, but a prophesy claimed that she would bear a son greater than his father. Prometheus knew of this secret, but he refused to reveal it to Zeus until he was freed of his chains. Only then did Zeus learn how dangerous Thetis was to him. He himself could have suffered the same fate that had befallen his father. The pilasters nearest to the windowed wall illustrate the myths of Saturn, who taught humans to value the advantages of culture, and Rhea, mother of Zeus. This extensive decoration was commissioned in the years following 1836 when the University’s main building was rebuilt after its destruction by fire during the English bombardment of Copenhagen in 1807. The architect Peder Malling was responsible for the construction of the new temple of learning. He wanted the building to be as impressive as possible: when it was almost complete, he asked his friend, the painter Christian Fædder Høyer, to decorate the vestibule. Høyer, a graduate of the Academy, had just returned from his educational tour of Italy. Malling, however, omitted to consult the University authorities about his decision, a mistake that would prove disastrous. The huge painted canvases were taken down and apparently destroyed almost immediately. Malling was so upset that he resigned. During the following years the University authorities vacillated between giving priority to the decoration of the ceremonial hall, called Solennitetssalen, or to the vestibule. Funds were limited, so they lacked the means to pay for the decoration of both at the same time. On 22 December 1837, a Royal Resolution allocated an annual sum for the purpose of decorating these halls, and it was decided at the same time that the ceremonial hall should take precedence over anything else. Nonetheless, a convincing point in favour of giving priority to the vestibule was that it was the first room encountered by visitors upon entering the building, and should thus be transformed into a worthy environment for guests of this most learned house of the Realm. Since means were limited the University Senate turned to Denmark’s first art historian, Niels Laurits Høyen, to seek help in finding a suitable programme for the decoration and to contact a number of competent artists. Høyen was the right person to approach, for he was connected to the University as docent and was also a professor at the Academy of Fine Arts. He wasted no time in pursuing the matter, and proposed a decoration of the architectonic divisions which were already marked out on the wall spaces. These markings included the muses and several floating figures in the recesses halfway up the walls, combined with a relief frieze of Genii at the top. Earlier, the sculptor H. W. Bissen had been selected to make models for two free-standing sculptures of Apollo and Athena, but there was uncertainty on this point as well. Denmark had finally realized that Thorvaldsen had acquired an international reputation in Italy, and the University considered asking the Phidias of the North whether he cared to make models for two sculptures for the pedestals by the flight of stairs. The list of students at the Academy who eagerly applied for the distinguished commission speaks for itself: Christen Købke, Wilhelm Marstrand (who contributed many years later to the decoration of the ceremonial hall), Heinrich Eddelien, Adam Müller, Jørgen Roed and Hilker. This comprises an interesting collection of pupils of the artists J. L. Lund and C. W. Eckersberg. Constantin Hansen’s name was not listed with the other students, because he had already left for Italy on a study tour. Hilker took the plans of the hall with him when he travelled to Rome in 1838 and encouraged Constantin Hansen to help him with a draft.They complemented each other, for Hilker had trained as a decorative painter at the Academy of Fine Arts and Constantin Hansen had been schooled as a figure painter in the grand style of two outstanding professors, J. L. Lund and C. W. Eckersberg. A proposal from Hilker and Constantin Hansen was accepted by the university Senate in 1840. As the basis for their draft proposal, Hilker and Constantin Hansen studied and copied Pompeian decoration during a stay in Naples. Specifically, the style and acanthus frieze that runs beneath the ceiling is based on the temple of Isis in Pompeii. In Rome, they meticulously studied the impressive murals by Raphael in the Stanzas and Loggias of the Vatican palace, together with Michelangelo’s decoration of the Sistine Chapel. The Loggias provided the model for their pilaster decoration, but it was Hilker who´suggested that Raphael’s exotic flora and fauna be replaced by Nordic ones. It did not escape Constantin Hansen that Athena and Apollo can be seen in niches in the middle ground architecture of Raphael’s “The School of Athens” in the Stanza della Segnatura. In addition, Bissen had been commissioned to sculpt Athena and Apollo just before he made a study trip to Rome in 1841. The coloration of the Sistine Chapel made a strong impression on Nordic painters who visited Rome in the 1830S and 1840s. Ditlev Blunck, for instance, wrote home to Professor Lund in 1838 that it was impressive to see a decoration which resembled a vast water-colour painting. Until the Chapel underwent extensive restoration in recent years, it was difficult to understand this description. In his article, Constantin Hansen clearly acknowledges his sources. 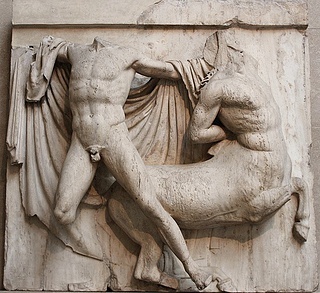 Reliefs from the Parthenon (fig. 83, 84), Attic patterns and vase motifs supported contemporary conceptions that Constantin Hansen, like Thorvaldsen, was a “Greek” in his classicism. Thorvaldsen’s position in Rome and his extensive activities there have also left their mark; we can assume that his admiration of, for instance, Raphael’s treatment of Psyche in the Villa Farnesina may have inspired Constantin Hansen. If Hansen’s frieze depicting the Argonauts on the island of the Bebryces looks slightly familiar, the explanation is that the Danish historian and archaeologist P. O. Brøndsted had just published his book on the Ficoroni Cista, in the Villa Giulia Museum in Rome. In his frieze, Constantin Hansen has eliminated all the minor details and reproduced the figure composition itself. FIG. 84. The Parthenon, south metope 27; 447-442 B.C. H: 137 cm. London, British Museum. Contemporary painters in Rome took a special interest in the use of older painting techniques for murals. The Nazarenes were German painters who succeeded in reviving interest in fresco techniques. They obtained a number of commissions in Rome, including the decorations of Casa Buti and Casino Massimo. One of these painters, Peter Cornelius, was a friend of Thorvaldsen and deposited his works in one of Thorvaldsen’s ateliers when he had to return to Munich for personal reasons. The two Danish painters also paid a visit to Peter Cornelius’s school in Munich on their journey home from Rome, to familiarise themselves with fresco techniques and to view works in the city carried out for King Ludwig of Bavaria. It is possible to gain a partial impression of the way in which the decorations gradually took shape. We have at least seven different drafts by Constantin Hansen and Hilker of the decoration for the University vestibule. It is difficult to date these with complete precision, but they must have been produced in the period beginning December 1838, when Hilker arrived in Rome, and during the years following. Occasionally, Constantin Hansen visualized a grand programme, which was to encompass both vestibule and ceremonial hall. His speculations reflect the uncertainty that continued to prevail, because the University authorities and the King had not yet made their final decision. The drawings illustrate the way in which the two artists followed Høyen’s proposal. They experiment with various colour combinations, and decorative elements combined with simple figure presentations. Little by little the decoration becomes more and more figure-dominated, until the decorative acanthus boughs almost disappear. FIG. 85. 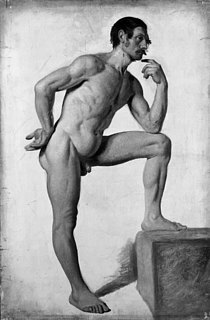 Constantin Hansen (1804-1880): Male Model, 1845. 55×37 cm. Oil sketch, paper on canvas. Statens Museum for Kunst, Copenhagen. lnv. no. 3456. The draft programme for the main wall, which incorporates the portal leading into the ceremonial hall, appears to have been completed by 1840 and this became the proposal eventually supported by the University Senate in 1843. The pilasters and recesses, the creation of the architect, were already there. Hilker’s pilaster decorations divide the wall area into three monumental and over-lofty fields between the low plinth and the frieze under the roof. Constantin Hansen countered the effect of vertical upward thrust by not only filling in the recessed fields with three large paintings, but also by including three smaller series of figures above the paintings. He marks off the horizontal division and separation between the image-bearing space and the plinth with the frieze under the picture. The part around the door is indicated as a brick-patterned black wall. FIG. 86. Constantin Hansen (1804-1880): Prometheus fashioning Man from Clay, 1845. Study for central panel of the main wall in the entrance hall. 37×39.5 cm. Oil sketch, paper on canvas. Statens Museum for Kunst, Copenhagen. lnv. no. 3665. In 1843 Constantin Hansen was summoned homefrom Rome and, following his stay at Peter Cornelius’ fresco school in Munich on the way, began work in 1844. The drawings for the main wall were produced during the course of the winter. In the summer of 1845, Constantin Hansen managed to paint the small semicircular fields showing Selene in the chariot of the moon and Helios in the chariot of the sun, then the middle field depicting Psyche, and finally the main field showing Prometheus, who has created a human figure, and Athena, who endows it with life. The side fields and the frieze were completed the following summer. At the same time, Hilker worked his way down the pilasters, and the ashlar-patterned base of the walls could thus also be completed. At that point, the University had intended to stop the work, but Constantin Hansen succeeded in changing the minds of the authorities. He and Hilker thus managed to continue their work in the years following. The procedure was the same for the side walls, and finally, in 1853, the entire painting was completed. In December of that year, the professor of philology and an ardent archaeologist, I. L. Ussing, described the decoration in Fædrelandet (The Fatherland). He was unsparing in his praise of the artists’erudition and thorough knowledge of classical mythology and the pictorial art of antiquity. Ussing also endorsed their selection of fresco as the correct technique for a decoration in the grand style. Frecso demands breadth of vision and confidence: it provides a challenge that only a master can meet. Unfortunately, a moist climate and considerable temperature variation in summer and winter proved a severe trial for the plaster, as was exacerbated by undetected cracks in the masonry. As a result, salt worked its way through to the layers of paint, which blistered and eventually flaked off. Even during Constantin Hansen’s lifetime the decorations had reached a sad state of deterioration. Since the original technique did not prove durable, the walls were restored by every conceivable means. The most extensive restoration occurred around the turn of this century, when the ceiling was washed down with lye and several sections of the walls chipped off. In accordance with the tastes of the time, Constantin Hansen’s spirited and classicist figure compositions became coarsened with paint on both sides of the outlines and grimacing expressions. In 1978, when the most recent cleaning and repairs were carried out, it could be seen that very little of the original painting remained. entirety. When he concieved his decoration, he regarded all the walls as part of one grand concept. Constantin Hansen’s interpretations of the concept underlying his decoration were expanded by Professor Ussing. He was delighted with the symbolism employed and suggested that it was quite appropriate to use Helios and Selene as a reminder of time, “These two great symbols of time which the Heavens constantly display to man”. He reminded the reader that Prometheus was not a human being himself, but a symbol of the struggle of the human reason. Reason flouts prejudice and external obstacles, and through steadfastness and confidence in its own strength, finally triumphs over opposition. But reason is only justified when it is seen in the light of its full godlike greatness and infallibility. In contrast to Prometheus, who is neither god nor man, the human lot is a different one. Human beings are weak and hampered by their earthly desires. Only through a long trial of misfortune and opposition do human beings learn to recognise their insignificance, and only through heavenly love and intervention can human beings find freedom. With respect to the enlightening and ennobling influence of art on human thought, Ussing was pleased by the presentation of Apollo as both the Genius, the soothsaying god, who shows himself to man, and as the one whose music can conquer all that is base and earthly. He is also entranced by Athena, the symbol of scholarship, intellectual light and untiring diligence. There is no doubt that Ussing’s account agrees with Constantin Hansen’s intentions, but, in his 1857 article, Hansen suggests yet another ambitious possibility, a possibility which situates Hansen and his colleagues as an active and fundamental part of the programme itself. Constantin Hansen writes of the central field of the main wall: Prometheus stands for the artist with his completed figure of clay. In this comment he identifies with Prometheus and allows this rebel and insurgent, who will not be bound by limitations, to represent the artist. Prometheus the artist carries out one part of the task, he creates the human being, and Athena, the symbol of scholarship, gives it breath. The one camiot exist without the other. The artist and the scholar must work side by side if their efforts are to be successful. Here Constantin Hansen is joining the ranks of those who advocate that artists be accorded respect equal to that given to scholars. This tradition has its roots in the early Renaissance, for instance in the writings of Cennino Cennini, and numbers among its supporters Gian Battista Alberti and Leonardo da Vinci. It is interesting to note that in 1829 Cavalier Tambroni dedicated his publications of Cennino Cennini’s Il libro dell’Arte to Crown Prince Christian Frederik, who later became Christian VIII. Unfortunately, there is no indication that knowledge of this book reached the Danish painters. By means of these speculations, Hansen created a bourgeois footnote to the programmes with which the absolute monarch surrounded himself in the courtly halls and audience chambers of his palaces. This is wholly compatible with Hansen’s efforts to express his sympathies for a social change that moves in the direction of democratisation. His wish to reinforce the content of the motifs and to surpass the boundaries of individual genres is clearly evident in his later monumental painting of the Constitutional Assembly of 1848, which he executed for a supporter of the National Liberals Party, Consul Hage. The painting was done in 1862, when the liberals were in need of moral support, and it speaks clearly of Constantin Hansen’s conviction of the importance of works of art and their possibility of influencing and ennobling man. Constantin Hansen could not allow art to enter the service of practical political ends: this he indicated by rejecting conclusively a proposal of this nature put forward by Orla Lehmann. Nevertheless, there is no doubt that he made use of his professional craftsmanship and intellectual capacity when he felt it to be in the service of the nation or of humanity. Here the University of Copenhagen provided the ideal frame.